In the course of working digital electronics projects, it’s unlikely that you will have to convert a number between binary and decimal. If you do find that you need to convert binary numbers to decimal, or vice versa, and you have access to a computer, you can use the Calculator program that comes free with Windows to do the conversion for you. The Calculator program has a special Programmer mode that many users don’t know about. When you flip the Calculator into this mode, you can do instant binary and decimal conversions, which occasionally come in handy when you’re working with IP addresses. You can select the Hex, Dec, Oct, and Bin radio buttons to switch from decimal to the different numbering systems commonly used in digital electronics: hexadecimal, octal, and binary. For example, to find the binary equivalent of decimal 155, enter 155 and then select the Bin radio button. The value in the display changes to 10011011. The Programmer Calculator has several features that are designed specifically for binary calculations, such as AND, XOR, NOT, and NOR. The Programmer Calculator can also handle hexadecimal conversions. Hexadecimal doesn’t come into play when you’re dealing with IP addresses, but it’s used for other types of binary numbers, so this feature sometimes proves to be useful. 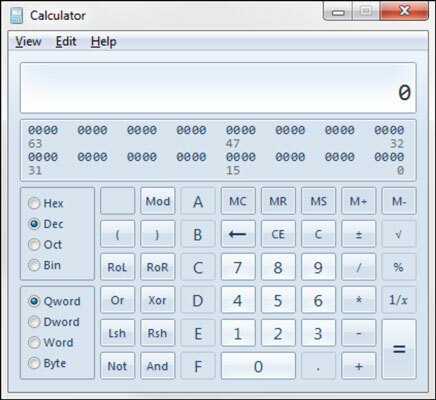 The calculator in earlier versions of Windows (prior to Windows 7) doesn’t have Programmer mode. However, the older versions do have a Scientific mode which included features for working with binary numbers.